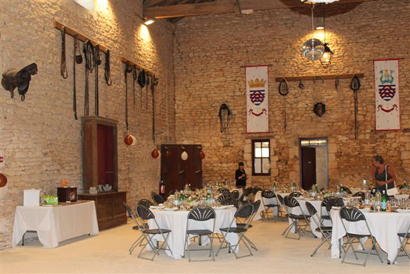 The Barn offers an impressive volume of a capacity about 200 seated dinner guests. Outing of a space caterer with work-top and equipment to connect the equipment. The space is flexible and toilet new and in the standards of accessibility for disable persons were fitted out. The big courtyard offer a case for your receptions and cocktail . The access this fact by majestic gate of honor of the castle of Verteuil. This room at the heart of the secular park is a place of exception for your demonstrations.